After launching its 7th-gen A-series notebook chips based on “Bristol Ridge” architecture in May, AMD says more powerful Bristol Ridge chips are now available for desktops. The new chips are said to offer a 17 percent CPU performance boost over 6th-gen AMD chips, and 27 percent better graphics performance. AMD also likes to compare its processors to rival Intel’s… and while Intel generally has had the lead in CPU power in recent years, AMD’s processors tend to have higher-performance integrated graphics (and lower price tags). This year is no different: the company says an AMD A12-9800 processor with AMD Radeon R7 graphics scores nearly twice as high in the 3DMark 11 graphics benchmark as an Intel HD i5-6500 processor with Intel HD 530 graphics. Of course, AMD has a vested interest in cherry picking benchmark results that show its chips in the best light, but it shouldn’t be long before users and journalists can publish their own real-world impressions: HP and Lenovo will be launching desktops with Bristol Ridge chips soon, and AMD says other PC makers will follow suit eventually. The new Bristol Ridge desktop chips are designed to work with AMD’s new AM4 socket, which also supports lower-power Summit Ridge chips and the company’s upcoming Zen processors… which means if you buy an AM4 motherboard this year, you should be able to equip it with a next-gen AMD processor when those chips are available. I’m pretty sure AMD4 is AMD’s socket. Yep… and actually it’s AM4 socket… my brain has apparently decided to take Labor Day off. And others don’t do that. Did I suggest they didn’t? I’m just saying you should always take benchmarks provided in a press release with a grain of salt. I think I rushed to post that. Looking at those benchmarks on other sites and how they swap between models, I see what you mean. My apologies. 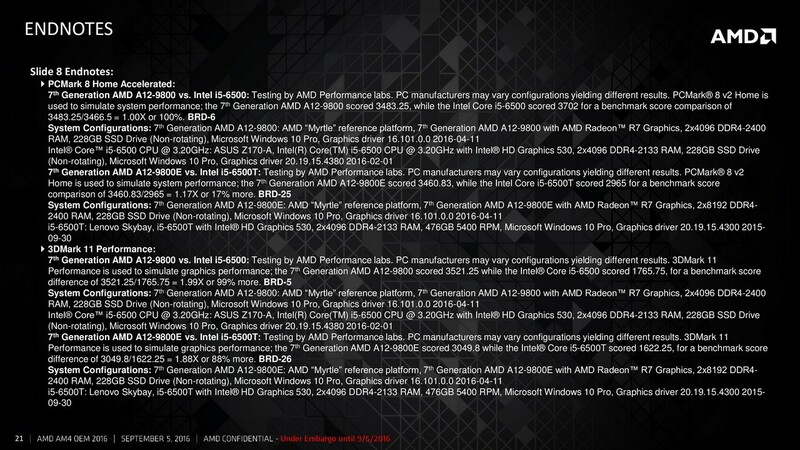 They are not even comparin with the best last gen APU either…..
PCMark8 Accelerated use OpenCL, so it favors faster Radeon iGPU inside the APU. Lookit below. 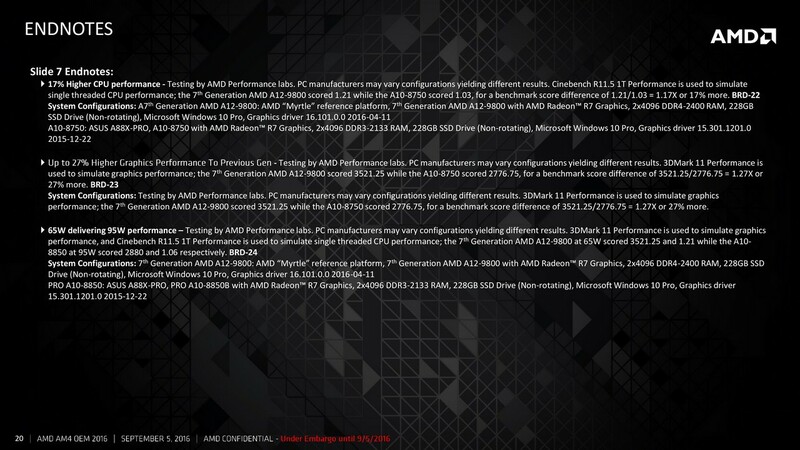 Heres the part ‘the 7th Generation AMD A12-9800 scored 3483.25, while the Intel Core i5-6500 scored 3702 for a benchmark score comparison of 3483.25/3466.5 = 1.00X or 100%’ …… So if ‘Intel Core i5-6500 scored 3702’ then its 106% faster than A12-9800. So where does does that ‘3466.5’ come from? Also note the difference in mem speeds….